I'm really loving pasta salads right now. And see the goat cheese? It's one of my weaknesses. I can eat an entire container (or log, in this case) in one sitting. No kidding. I like it on crackers, in pasta salads, on hamburgers... I could go on. This recipe was inspired by the Lemon Thyme Vinaigrette I used a couple of weeks ago in the Summer Pasta Salad. We ate this as a side dish with Jalapeno Bacon Burgers but you could add some grilled chicken or shrimp and make it a main dish. Cook pasta according to package directions, adding sweet peas and snow peas during the last minute of cooking. Drain. In a small bowl, whisk together thyme, lemon zest, vinegar and garlic. Drizzle in the olive oil while continuing to whisk. 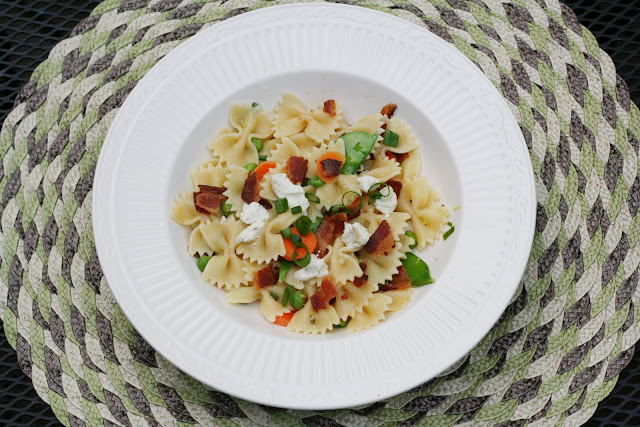 Toss the pasta mixture with the carrots, onions, bacon, and vinaigrette. Top each serving with goat cheese crumbles. Serve warm or chilled.